The Angriest: Star Trek: The Next Generation: "Genesis"
It is 21 March 1994, and time for another episode of Star Trek: The Next Generation. An unexplained disease begins to affect the Enterprise crew in different ways. 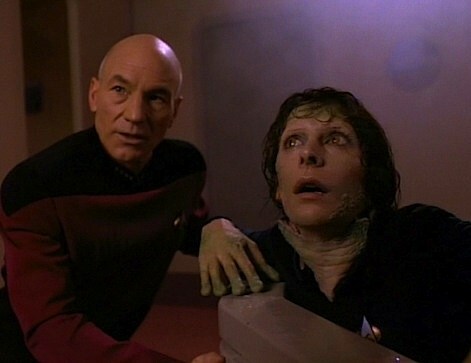 When Picard (Patrick Stewart) and Data (Brent Spiner) return to the ship after an away mission, they find the entire crew have devolved into a variety of animal-like creatures. At the time of its broadcast I felt reasonably certain that "Genesis" was the worst episode of Star Trek: The Next Generation ever made. I hated it so much that it has taken me more than 20 years to get around to watching it a second time. It is still awful, but time has somehow made it that special kind of awful in which - once you overcome its silly premise and unconvincing make-up effects - it's a strange kind of fun. It's an episode in which Deanna Troi (Marina Sirtis) is a fish person and Picard begins to transform into a lemur. It's hard to top that kind of insanity. This is a rare case of Star Trek going out of its way to produce a horror story, rather than a science fiction adventure, and it's fair to say that in some ways it actually works. Gates McFadden makes her directorial debut here, and she has a strong sense for timing and atmosphere. The various mutated prosthetics were never going to match the ridiculous demands of the script - Troi as a frog monster, Worf (Michael Dorn) a mutant proto-Klingon, Barclay (Dwight Schultz) a demented half-spider - and so McFadden wisely keeps most of the action in the shadows and only momentarily glimpsed. It's a classic horror filmmaking technique, as it not only masks budget shortfalls it ups the tension at the same time. The cast undertake their roles gamely, which is more than the script deserves. It's notably Dwight Schultz's final on-screen appearance in The Next Generation, although he does return in the film First Contact and a handful of Voyager episodes. Patrick Stewart gives Picard a wonderful absurd dignity as Data informs him that he's about to transform into a kind of monkey. Brannon Braga's script really is awful. It seems a redundant complaint to say that the science is inaccurate, but "Genesis" goes a fair distance beyond technobabble and gobbledegook. Evolution simply doesn't work this way, and there's a difference between inventing a fictional phenomenon and completely disregarding how biology works. There is no reason why each character transforms into a different species of creature either; the episode concludes with the explanation that Dr Crusher (McFadden) made a mistake while treating Barclay's illness. That's anti-climactic and dramatically weak. That everyone dives into the garbage script with such gusto is the only thing that perversely saves the entire episode; if the cast are game for the stupidity, why not the audience? This is a terrible episode by any reasonably measure, but goodness I found it a laugh. No matters its other qualities, I was entertained, so into the 'good' pile it goes. It doesn't deserve to be there, but there you go. The quality ratio for Season 7 rises to a still-mediocre 53 per cent. Okay, so before you go though: let's talk about Data's cat. "Genesis" begins with Data taking his heavily-pregnant cat Spot to sickbay for a veterinary examination. Spot first appeared in the Season 4 episode "Data's Day" as a male Somali breed. Subsequent appearances presented Spot as a male orange Tabby breed, until this season's "Force of Nature" - when Spot was suddenly female. This begs the question: are there multiple Spots? If we disregard the obvious 'no one was paying attention' answer, it seems that either Data has gone through three cats in three and a half years, or Data is experimenting on his cat. Either explanation is worryingly believable. Both lead to the same conclusion: poor Spot.